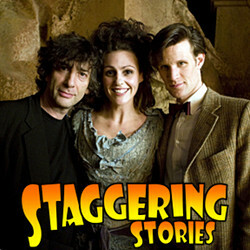 Staggering Stories Podcast #107: You’re My Wife Now! 02:42 — Doctor Who: The Impossible Astronaut most recorded British TV ever. 04:52 — TV Choice Awards: Another split votes problem for Doctor Who/Sherlock? 06:45 — Karen Gillan: At the London Film and Comic Con 2011, Saturday 9th July. 08:10 — American TV: ‘Ax’ falls on many genre shows. 08:56 — Noel Clarke: Dunn construct 1 meets Mickey the Idiot. 09:58 — Jean Acts: Our very own Jean to play the Fourth Doctor in Morris play. 11:01 — BAFTAs: Nothing for Doctor Who but Sherlock gets two, Misfits one. 12:59 — David Tennant: Facebook campaign for lighting Olympic Flame. 14:00 – Doctor Who: The Doctor’s Wife. 25:39 – Doctor Who: The Rebel Flesh. 91:17 – Farewell for this podcast! 91:50 — End theme, disclaimer, copyright, etc. Facebook: Petition to get David Tennant to take Olympic Flame the last 500 yards!. BBC: Doctor Who – The Rebel Flesh. Adam J Purcell, Andy Simpkins, Karen Dunn and Keith Dunn sit down, tallied, in front of the 2011 Doctor Who episode, Day of the Moon, and spout our usual nonsense! BBC: Doctor Who – Day of the Moon. Adam J Purcell, Andy Simpkins, Karen Dunn and Keith Dunn sit down, forgotten, in front of the 2011 Doctor Who episode, The Impossible Astronaut, and spout our usual nonsense! 02:06 — Doctor Who: The Impossible Astronaut ratings were excellent. 04:53 — BAFTA Nominations: Matt Smith for Doctor Who and other nominations for Misfits, Being Human and Sherlock. 06:00 — Primeval: Back on UK screens, on cable channel Watch, on May 24th 2011. 06:20 — Sarah Jane Adventures: No new episodes to be shot but existing unaired ones will be screened. 07:50 — William Shatner: The Shat is going to dramatically interpret classic rock music. 11:59 — Misfits: New character, Rudy, is to be played by Joe Gilgun. 13:29 – Doctor Who: Day of the Moon. 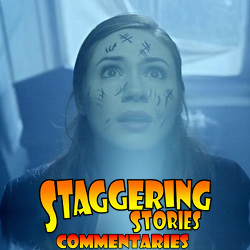 35:55 – Doctor Who: The Curse of the Black Spot. 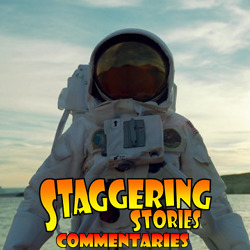 50:28 – 30 Second Recommendation: Staggering Stories. 95:33 – Farewell for this podcast! 96:16 — End theme, disclaimer, copyright, etc. Staring Professor How’s own Graeme “The2ndDoctor” Sheridan, the Cultdom Collective’s Ian “The6thDoctor” Bisset and Dave “AC” Cooper, Professor Dave’s Ark in Space’s “Professor” Dave Keep, Elizabeth “Lillybet the Wonder Girl” Peloso & Doctor Thomas.